Making Pear Sauce is a great alternative to applesauce when you have an abundance of pears, and tastes just as sweet even with no sugar added! My guys actually prefer pear sauce to apple sauce, so I try to make a lot of it. The procedure is similar to canning sliced pears, with just a couple of key differences. Here’s my favorite pear sauce canning recipe, you may sweeten to taste, though I never need to add any sugar. canning tools: a jar lifter, a lid lifter, and a funnel. 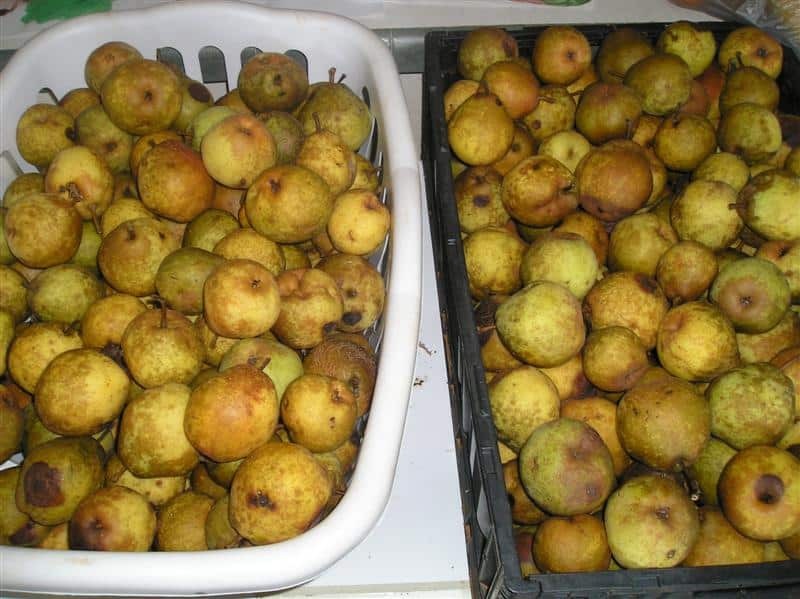 **You can save the peels and cores (those without insect damage or bad spots) to use to make pear jelly! Remove any bad spots from the fruit. Slice, cut out the hard pit section, then chop into small-ish pieces. In the meantime, make sure you have some mason jars cleaned, sanitized and HOT. The easiest way to do this is to run them through the dishwasher. You can use pints or quarts, wide mouth or regular, whatever suits you best. I can pear sauce in quart jars. My four kids will kill a whole quart of sauce in a single snack break, so it’s best for me to save lids and go with the bigger sized jar. You can also wash the jars by hand, and then submerge the jars into a large pot of boiling water to keep hot and sanitized. Sometimes I will also put clean jars into a hot oven (set at around 250* then turn off) and let them sit in there to keep hot until I’m ready to use them. Once you have all of your pears peeled and cut up, put them into a large pot. Fill it with just enough water to keep the pears from scorching (an inch or so in the bottom of the pot), then cover and cook over medium or med/low heat, stirring occasionally, until the pears are thoroughly soft. The next step is to puree the pears. I use a Back to Basics Food Strainer. It’s a little messy, but it does a good job. I have to use it in my bathroom, though, ’cause it’s the only counter the strainer will clamp onto. Kindly overlook the potty. Return the pureed pears to the pot. Taste to see if you need to add any sugar, though like I said I never have to sweeten it at all. Bring the pear sauce to a gentle boil. While that’s heating, have your lids simmering in a small pot of water (not boiling!). You can see I have some jars in boiling water here as well, waiting to be used. Once the pear sauce reaches a light boil, continue boiling as you fill the hot jars one at a time. Stir the sauce every now and then to prevent burning. Leave 1/2 inch headspace (fill the jars to within 1/2″ from the rim). Use a wet rag to wipe the rim of the jar clean. I usually dip my finger in the simmering lid water and run it over the rim after wiping, just to make sure there isn’t anything sticky still there. and place the lid on the jar. Now screw on a clean ring to tighten down the lid. Once all of your jars are filled and sealed, place them in a water bath canner. 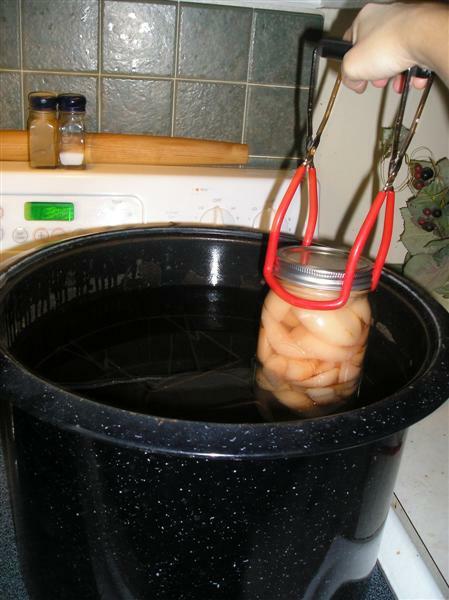 Fill the canner with enough water to cover the jars with 1-2″ of water. Put the lid on the canner, and bring to a steady rolling boil. Continue to process pints or quarts at a steady boil for 20 minutes. Once the time is up, use a jar lifter to remove the jars from the water bath canner. And look! They’ve magically turned back into whole pieces! Just kidding. This is a picture from when I canned sliced pears. But you get the idea. Allow the jars to cool overnight, preferably on a rack . After about 24 hours, remove the rings from the jars and try to pry the lids off with your fingers. If they do not come off, they’ve sealed and are safe to store. If a lid does come off you can either put the jar in the fridge to be eaten soon, or if you really want to store it up, you can pour the sauce back into a pot and can it over again in a new jar, with a new lid. Don’t forget to write the date and contents on the lid with a sharpie. Pear Sauce will stay fresh for up to a year before the taste, texture and nutrients begin to diminish. That is not to say they won’t be safe to eat, they just won’t be as good as they were within that first year. Before putting your jars up, remove the rings from the lids. Over time, these can corrode and become hard to remove, so it’s best to store jars without them. If at any point a lid unseals on its own (not likely to happen, but possible), the contents have been compromised and are no longer safe to eat. Have you ever tried pear sauce? Have a tip to share? Wild Food Knowledge Package Giveaway! Having made a great batch of applesauce last year without peeling them–the skins vanished while cooking–I tried the same with pears. When tasting the pear sauce, however, I felt like I had a mouth full of sand. Would peeling them this year produce a better result? What is the purpose of peeling the pears? With the food mill you have doesn’t it take the skins off? The food mill takes all skins and seeds. The mill does handle all the peels and seeds, but you have to clean it more often than if most of the pulpy peels are removed first. I have a Foley Food Mill and the holes get plugged up so you have to clean it as you run a lot through. When making a large batch you might want to divide it in half or thirds. This allows you to make regular, cinnamon flavored or add a hint of ginger to the third batch. Good luck and I hope you like my suggestions. This tutorial is superb! You covered every detail clearly. I would like to pressure can my apple pear sauce instead of BWB. Do i process for the same amount of time as apple sauce (5lbs for 10 min for quarts)? If you put the pears in boiling water for a minute or so and then ice water (just like tomatoes) the skins come right off. Actually, I have used just cold water and had success. This is sooooooo much easier the peeling. I have some pears that are already soft – can I just puree them and cook the puree? Of course, the ripest pears are the sweetest. I want to share a variation of this that I have made several batches this week of. I am currently canning the last batch and making fruit leather out of what’s left. I cut pears (leaving the peel on)in half and half again, cut off the core, seeds and stem. Filled that crock pot as full as I could. Added a bit apple juice as a liquid. Cooked on high for 3-4 hours. Cooled slightly and scooped into the vita-mix on high for about 45 seconds, poured back into crock pot and added cinnamon and pumpkin pie spice. Followed your canning recipe. Leaving the skins on made a huge difference in prep time and more of the vitamins. They were all puréed and is amazing how good it tastes. Wonderful! Thank you for sharing that with us, Kelley! That sounds good. I would like to avoid peeling my fruit as well. I just never liked the graininess of the pear peels! I also have a Vitamix and it would probably blend those skins up really well! My pear sauce is not at all thick- my daughter had hoped to use it for baby food but it is to runny. I did not add additional water when cooking them. Does it thicken as it sets in the jars? It might have needed to cook down a little more? It will still taste good, even if it’s a little runny. Could you add a thickener like Xanthum Gum? You can with jelly. Thicken with Clear Gel. It is made specifically for thickening and canning at a high heat. Quick question about your water bath canner. I see that you are using it on a glass cooktop. I just got mine and have a glass cooktop as well. When reading the directions, it mentioned not to use it on a glass cooktop. Have you ever had any problems? As long as you are careful not to drop or slide the canner on your flat top stove, you shouldn’t have any trouble. I’ve been doing it for 7 years now, no problems ever. I don’t know if I might have missed something but I didn’t read anywhere if I drain the cooked pears before I puree. I’m in the process of cooking my pear chunks to soften but don’t know if I’m suppose to drain the water or use it to puree before I cook it. Well I hope to hear from you. Thank you for the great recipe. If there’s a lot of water I’d drain it a little. But some liquid will help the pears puree better. Good luck! Can I make pear sauce from the sliced pears I canned last year and can it? Thanks! First time making pearsauce. Can I cook them down to the sauce and make tomorrow. I love this recipe! This was my first time canning alone and only my second ever! I was given a bunch of pears and wasn’t sure what to do with them. I was searching on Pinterest to find recipes for canning pears and I saw your recipe and “how-to” on pear sauce. I am making it right now! Thank you for the pictures. I can go step by step and know that what I’m doing is correct. When time is short, how about canning pears with the peels on? How about adding cinnamon candy hearts(you see them around Valentine’s day) to each jar. It adds a yummy taste and festive color. I did add hot cinnamon candies to a small batch because my granddaughter wanted it roast red. Super yummy and she’ll be so happy! Thank you for the canning tips as well as the recipe…extremely helpful! Thank you so much for this!! Your instructions were very easy to follow and it turned out delicious:) I added cinnamon, nutmeg and cloves right before the final boil and it tastes heavenly! I am very excited to exchange this sugar-free sauce for the applesauce the kids normally request. Thanks again! If you have a lot of pears on hand, you can make mincemeat for pies. Peel & core pears, then cut up into chunky pieces. Place in large pot. Add about a cup of water and squeeze a little lemon juice onto them. Then, add sugar or honey, plus cinnamon, cloves, ginger and allspice to taste. Throw in some raisins and/or currants. Simmer on low heat until pears are thoroughly cooked – mushy, but still chunky. Stir occasionally to prevent sticking. While still hot, place into hot, sterilized quart jars and seal. For the pies – Simply dump a jar of mincemeat into a pastry pie shell and bake until crust is golden. Being an exhausted working wife, i peel, quarter and core my fruits, apples or pears then let them cook on low in the crockpot for the day. When i return home i mash then process like above. Seems to give a deeper flavor. Happy Canning. I like my apple or pear sauce chunky, so I use a potato masher. It takes longer, but is worth it. Er…won’t your food mill separate out the peels and seeds? I just chop the pears coarsely, cook, and run them through. MUCH faster than peeling each pear! New grandbaby arriving soon, so I made applesauce in tiny jars yesterday. Then this morning I stumbled onto your site. Needless to say, I had a case of pear sauce in tiny jars before I knew it. To tell you honestly, I had never heard or tasted this sauce before. You got me hooked on it now! Thank-you so much!! So glad you tried it and love it, Diane. Congratulations on your new grandbaby!!! Kendra, I made the pear sauce and it tasted wonderful. the next day though some of the jars had turned slightly brown on the very top layer of the sauce. Is this anything to worry about? I’m making stuff out of about 100 lbs of pears. Wish me luck on getting most of them processed before they go over ripe and the chickens get a treat. Alot of them are real small and lots of waste. Next is my pear sauce. I add cardamom, ginger, clove, and nutmeg. Use have to play with it to get it to taste like you want. Basically for my sized pot of sauce I use 1 tsp cardamom (ground), 1 tsp of ginger (ground), 1/4 tsp of clove (ground), and 1/4 +1/8 tsp of nutmeg (ground)Add sugar to taste depending on ripeness of pears. Cardamom and ginger work well with pears.I also use this combo when making pear butter. Wow, what a blessing to have, Maryann!! If you followed the directions, then it should be fine. Sometimes liquids and solids separate in the jars after processing. It’s nothing to worry about 🙂 Enjoy! Do you have to use a bath if you are boiling the pears down. Can you just turn the upside down on the counter and let them cool through the night? If you do not process the pears in a boiling water bath canner, you are taking a risk of serious food poisoning. I wouldn’t try it. If you have a large stock pot you can use that as a water bath canner. 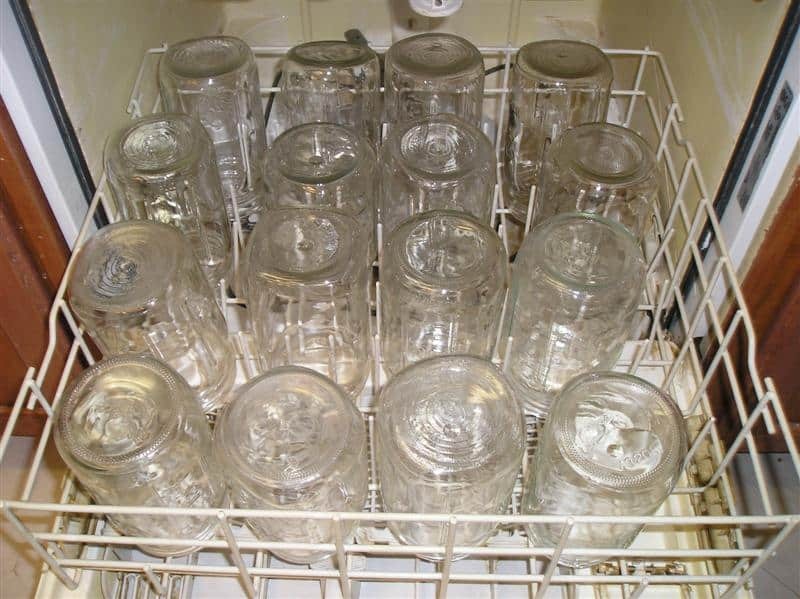 Just be sure to put a dish cloth or rack in the bottom of the pot to keep the jars off the bottom, and cover the jars with 1-2″ of water. Hope that helps! Thanks! My grandpa dropped of a 10lb bag of pears today, and I whipped up this sauce this morning with my 2.5 year old and 10 month old underfoot. Hi. I tried your recipe this weekend. We have a pear tree with lots of ripe pears and were trying to figure out what to use them for. You step by step instructions were very easy to follow. We made plain pear sauce and cinnamon pear sauce. Taste great. Thank you! Yay! That’s so great Sally 🙂 Enjoy!! This looks so good! I will do this with some of the pears I will be canning today. Is processing time in the water bath (20 minutes) universal or does it depend on elevation?? Sorry I didn’t get to answer your question sooner! Processing time does vary depending on elevation. When water bath canning at altitudes 1,001-3,000 ft add 5 min. to the processing time. 3,001-6,000 ft add 10 min. 6,001-8,000 ft add 15 min. And at 8,001 to 10,000 ft add 20 min. to the processing time. Hope that helps!! I just got through putting up the last of my pearsauce and am getting ready to put up pear slices. I make my sauce in the crockpot. You can put it on early morning and it is ready by afternoon. I do pull a lot of liquid off it and am going to use that in my pear slices. I never bother with the pear/apple processor. I just puree my boiled-to-softness pears or apples in the blender. Smoooooooooooooth. Great post. Never thought of making pear sauce. Looks easy and sounds good. Thanks. I have not tried pear sauce. I have put up applesauce. And it was good. I will have to try the pear sauce. Thanks for sharing. Thank you so much for this! I have never had pear sauce but am willing to try it and do something useful with any pears we find! I havent tried pear sauce, since they are expensive and I dont have an outlet for them. I have made pear butter from some organic pear baby food I got from someone. It was beyond good! Enjoy your pear sauce. Great tutorial, Kendra! We use pearsauce all the time, as it helps keep gluten-free baked goods moist. 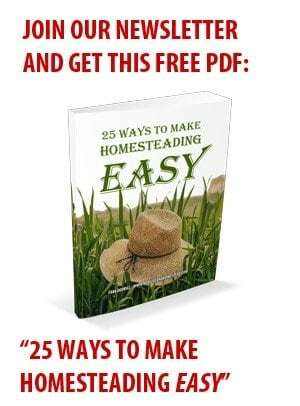 Thanks for sharing in easy-to-follow steps!